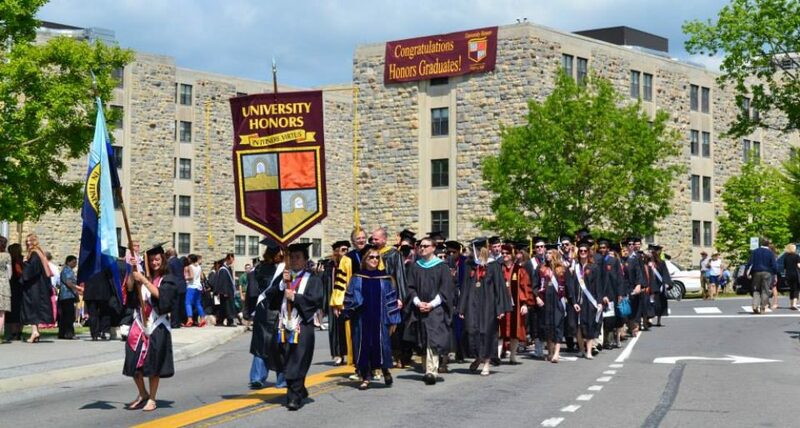 Public university honors colleges and programs continue to raise their profiles as “value” choices in higher education, as evidenced by columns in the New York Times, attention from college consultants, and a separate focus piece in the 2015 U.S. News Best Colleges publication. One section by Farran Powell, titled “Strategies for Students Too Rich for Financial Aid, Too Poor for College,” is especially interesting. Powell describes the experience of a mother in Illinois whose daughter was accepted by Boston College, where the yearly price tag was extremely high. “Our daughter got into Boston College at $68,000 a year,” says the mom, citing the total cost of attending without any need-based aid and paying in cash. But she and her daughter chose UConn’s honors program because they gave her daughter a $15,000 a year scholarship, leaving about $30,000 a year in total yearly costs, much less than regular out-of-state expenses would have been. “Households similar to [this] family from suburban Chicago are turning to honors programs and schools that hand out non-need-based aid…especially if they are ‘too rich for financial aid’,” Powell writes. “Many parents realize there’s a shortfall in funds available as the cost of college continues to climb,” Powell writes. “‘Thirty years ago, putting your kid through school was like buying a car. Now it’s like buying a house,'” the adviser told Powell. Powell writes that “Many National Universities, institutions that offer a full range of undergraduate majors as well as master’s and doctoral programs, offer these types of programs along with merit aid to attract high-achieving students to their campuses, college experts say. What did you like most about your years as a UConn Honors student? Living in Buckley, I was able to make friends with like-minded people and hope to continue these friendships after graduation. I think the Honors Program in general encourages students to get involved and be leaders, which is something I definitely did. What aspect of your Honors experience has had the greatest impact on you personally? The honors culture of achievement inspired me to be a leader and do many things that shaped my college career. How did your thesis experience contribute to your academic development? It taught me to value academics and the pursuit of knowledge, and I was able to develop relationships with faculty. I felt that I was more challenged, and therefore learned more, than the average college student. I also felt that I was surrounded by kids in class who were as intellectually curious, and cared, as much as I did. The challenge of the Honors Program gave me confidence to compete with strong students at interviews. … I was never hindered by intimidation, and I actually had more project work to talk about in interviews due to my honors’ experience. How did your Honors major advisor affect your UConn Honors experience? My Honors major advisor had an incredible impact upon both my Honors Program experience and my overall college experience. When Professor Clapp approached me about joining the Honor’s Program, I felt truly honored. In efforts to make the most of the opportunity he gave me, I have grown more intellectual than I thought was possible. Working on my thesis, in particular, I have challenged myself greatly and have consequently gained much more confidence and knowledge. My thesis was the greatest challenge of my academic career. In taking months to synthesize massive amounts of data, articles, and political perspectives I was able to develop a rich and cohesive response of my own. I take great pride in both having accomplished such a large project and also developing a work that is truly my own. Having successfully completed the thesis–which examined, and proposed some solutions to, Connecticut’s fiscal challenges–I now feel equipped to solve complex real-world problems in both my full-time job and as a concerned citizen. I like the opportunities that are available to honors students, like the Honors classes and conversion projects that help you apply your knowledge from lecture in a meaningful way. I also think the Honors community is very supportive, especially the faculty. The thesis project has had the greatest impact. As I read scientific papers in my classes, I do not realize how much work and detail goes into writing a paper for a journal. So, it was rather eye-opening to do it myself. Also the research I did was directly related to my field, and I would not have had the advantage I did when it came to applying to doctorate programs had it not been for the push to pursue a research lab. My Honors major advisor made my UConn experience worthwhile. She encourages me to make right choices and she is always realistic and resourceful….I could not have been successful without her. She always treats every one of my questions with great importance, and she has never let me down. My thesis made me realize the dynamic of working in research, and it definitely made me realize that going to graduate school for research or to pursue a PhD is not for me (which is a positive lesson in the end). I am still glad I pursued research for my thesis because I had a chance to learn specialized information specific to my field and to make good networking connections. The tightly-knit Honors community in Buckley ended up being where I would meet the friends who I’ve been closest with in my years as a Husky; having the common experience of Honors has been a fantastic bonding experience. The challenge of conducting my own research and synthesizing it into a thesis has helped me develop my analytical and writing skills far beyond what my regular courses pushed me to do. My Honors major advisor has been consistently helpful and provided very useful guidance — particularly in the process of writing my senior thesis. The senior thesis was a challenging but also fulfilling finish to my time at UConn. The challenge of conducting an independent research project helped me grow as a learner, and it’s also very satisfying to look back on a finished project of that size. The feeling that I was going above and beyond and challenging myself academically. Knowing that I can reach the higher goals that I set for myself. My Honors major advisor helped me find joy in doing research and have a better understanding of the research process. My thesis experience contributed to my academic development significantly. I made more connections in the community, learned new passions, and gained a better idea of how the research process works. Why was [Analysis of Social Welfare Policy and Social Service Delivery Systems, a first-year MSW course] one of your favorite Honors classes? I ultimately want to get my Master’s in Social Work. Having the opportunity to take a graduate level social work class, and enjoy it, made me feel confident in my decision. Editor’s note: This is another in our series featuring public university honors students who won prestigious Goldwater scholarships in 2014. This post comes from the UConn Honors Program…. Three UConn honors students have each won a 2014 national Barry M. Goldwater Scholarship for Excellence in Education. The scholarships, honoring Sen. Barry Goldwater, are designed to foster and encourage outstanding students to pursue careers in the fields of mathematics, the natural sciences, and engineering. The scholarships cover the cost of tuition, fees, books, and room and board up to $7,500 per year. Both sophomores and juniors are eligible to apply. Students are nominated for the award by UConn’s Office of National Scholarships, which supports them through the application process. Michael Cantara ’16 (ENG) is an honors student from Barrington, R.I. He is a recipient of the Universities Space Research Association Education Scholarship, and a Learning Mentorship Scholarship through the School of Engineering. As a sophomore recipient of the Goldwater Scholarship, he will receive two years of funding. Cantara has a passion for understanding the universe, and is currently conducting research in particle physics with Peter Schweitzer, assistant professor of physics, calculating “Q-balls, with a focus on their d1 term.” He is also working on a project with professor of physics William Stwalley and his team in the ultracold molecules laboratory. Although it is early in his research career, Cantara has already participated in a summer research experience at the Naval Undersea Warfare Center in Newport, R.I., and because of this experience now has a Department of Defense security clearance. Cantara is also an active member of the Society of Physics Students and UConn’s Physics Club, and has spent numerous hours doing community service. A musician, he plays both the electric and acoustic guitar and has taught others how to play. He also enjoys tennis, golf, basketball, cycling, and skiing. Peter J. Larson Jr. ’15 (CANR), an honors student from New Canaan, Conn., aspires to earn an MD/Ph.D. and become an innovator in the world of virology, viral vectors, or gene therapy. He is currently working in the lab of Paulo Verardi, assistant professor of pathobiology, studying methods to produce recombinant vaccinia viruses. He has presented two posters on his research and is collecting more data for publication. He has also been a research associate for the Tobacco Cessation Program at St. Vincent’s hospital in Bridgeport, Conn., and conducted field research on water quality in local rivers while still in high school. When he’s home, he is an active firefighter and EMT for the Vista Fire Department in Lewisboro, N.Y. (which is adjacent to New Canaan), and was named Rookie of the Year in 2011. On campus, he is also busy outside of the lab, as a member of the UConn Ballroom Dance Team, and within the Honors Program, as a student worker and a mentor with the PATH Honors Mentoring Program, among other activities. He has received numerous awards, including the James Dewitt Scholarship, the William H. Allen Scholarship, and an Academic Excellence Scholarship. In 2012, the UConn Residence Hall Association named him President of the Year by for his work on the Buckley-Shippee-Sylvie Area Council. Patrick J. Lenehan ’15 (CLAS), an honors student from Cheshire, Conn., is currently conducting research with Barbara Mellone, assistant professor of molecular and cell biology, on proteins and the formation of centromeres and kinetochores in Drosophila. He has also worked in the lab of Rajeswari Kasi, associate professor of chemistry, investigating the use of high-molecular weight poly-acrylic acid to stabilize enzymes, and is contributing to a publication with Dr. Melanie Collins, whom he shadowed in the Pulmonary Department at Central Connecticut Children’s Medical Center, on the treatment of pediatric patients with cystic fibrosis. He was previously a research assistant for Dr. Alireza Shamshirsaz in the Department of Maternal and Fetal Medicine at UConn Health, where he contributed to several publications on obstetrics. Ultimately, Lenehan plans to earn an MD/Ph.D., become a research oncologist, and advance treatments of the disease. At UConn, his stellar academic record has earned him recognition as a Babbidge Scholar. He is also the recipient of the Presidential Scholars Award Scholarship and the United Technologies Corporation Academic Scholarship. In addition to his demanding course load and research schedule, Lenehan is a member of UConn’s NCAA Division I Men’s Basketball Team.